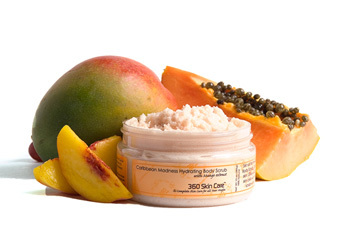 Set sail for the Caribbean with 360 Skin Care’s Caribbean Madness Hydrating Body Scrub. Gently buff away dull dreary skin to reveal a new layer of youthful skin. Give your skin a boost with Vitamins A & C, and slow the deterioration of skin cells with Mango Extract. Packed with nourishing oils, our 2 in 1 hydrating scrub will rejuvenate your skin and leave it feeling soft, silky and smooth.